A 1960s innovation prioritizing idea over execution. At its extreme, a conceptual art work may consist only of a brief written description or set of instructions for fabrication. However, in practice, conceptual art intermingled freely with other 1960s and 1970s tendencies, such as minimalism, earth art, and performance art, as well as politically oriented art. It has also affected the underlying ethos of later art. Conceptual art repudiated abstract expressionism’s emphasis on process and psychology, pop art‘s acceptance of commercial and popular culture, and minimalism’s attention to physical presence. Because conceptual art generally undermines craftsmanship, it also offered a rebuff to the art market’s growing appetite for saleable products. With his cerebral credentials, Marcel Duchamp ranks as the grandfather of conceptualism. Sol LeWitt‘s 1967 “Paragraphs on Conceptual Art,” published in Artforum, served to crystallize the movement. Robert Morris, Bruce Nauman, and John Baldessari number amid prominent artists who have contributed to conceptual art. Among other figures associated with the movement, Hans Haacke (1936– ) ranks among the most central. Concerned predominately with systems, his art has proved highly controversial when he brings to light unsavory connections within social or economic relationships. Born in Cologne, Hans Christoph Carl Haacke graduated from the state academy in Kassel in 1960. He spent the following year in Paris, where he worked at Atelier 17 and became acquainted with Yves Klein and other avant-garde artists. In 1961 he embarked on a year of study at Temple University in Philadelphia. From 1965 he has lived mainly in New York. As he attempted during the 1960s to detach his art from objects, he presented as works of art such real-time physical systems as Chicks Hatching (1969) and Grass Grows (1969). After turning his attention to social structures around the end of the decade, he achieved widespread notoriety in 1971 when the Solomon R. Guggenheim Museum canceled an exhibition of his work, which included one particularly grating display. Based on research into ownership of substandard housing, this investigation unmasked ties between slum landlords and powerful public individuals, including museum benefactors. While continuing to pursue such projects, presented with photographs and text, Haacke did not entirely give up the painting that had been at the center of his early endeavors. Since 2002, he has been an emeritus professor at Cooper Union, where he taught for more than thirty years. Joseph Kosuth (1945– ) has staked out an analytical stance that focuses on language and the effects of context on meaning. Initially drawn to the ideas of Ludwig Wittgenstein and A. J. Ayer, he later shifted his interest to theories of Freud and Jacques Derrida, among other ambitious thinkers. 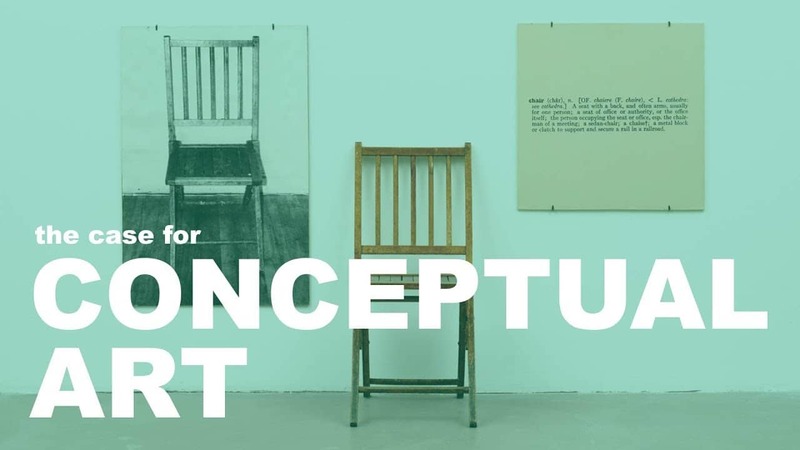 Kosuth’s early and paradigmatic One and Three Chairs (Museum of Modern Art, 1965) juxtaposes an actual chair with a full-scale photograph of a chair and an enlarged photograph of a dictionary definition of the word. A 1969 essay, “Art after Philosophy,” published in three parts in Studio International, established his credentials as a leading proponent of “idea art.” Over the years, Kosuth has gradually elaborated the visual qualities of his work while also remaining engaged with linguistic problems. Born in Toledo, Ohio, Kosuth studied at the Cleveland Institute of Art for a year before heading to Europe in 1964. Upon settling in New York the following year, he trained for two years at the School of Visual Arts (where he later taught for nearly twenty years) and subsequently took classes at the New School for Social Research (now New School). He divides his time between Europe and New York. Douglas Huebler (1924–97) stopped making objects in 1967, afterward concentrating on ephemeral interventions documented with photographs, maps, charts, and texts, often wryly piquant in tone. Earlier, he was a painter of geometric abstractions before taking up minimalist sculpture in 1962. Born in Ann Arbor, Michigan, Huebler served in the military during World War II before studying painting in Paris and at the Cleveland Institute of Art. In 1955 he earned an MFA at the University of Michigan. His extended teaching career culminated in a stint of more than twenty years at the California Institute of the Arts in Valencia. He died at his home in Truro, Massachusetts, on Cape Cod. Japanese-born On Kawara (1933– ), who has resided primarily in New York since 1965, is best known for an extended series of paintings displaying only the date of their execution. Begun in 1966, this sequence and other works, such as the “I am still alive” telegrams sent to friends in the 1970s, draw attention to the passage of time and its relation to human experience. Also Japanese in origin, Shusaku Arakawa (1936– ) generally collaborates with his American wife, poet Madeline Gins (1943– ). About two years after settling in New York in 1961, he initiated a decade’s concentration on a series of paintings addressing the theme of the Mechanism of Meaning. Later, he gradually extended his explorations of verbal and visual signification into architectural studies. New Yorker Lawrence Weiner (1940– ) has since the late 1960s centered his work on language. Most of his dematerialized work appears in the form of wall texts, books, posters, or other means of widespread dissemination, including videotapes and compact discs, but he has also in recent years occasionally produced physical monuments that draw attention to site-specific meanings.